Synopsis: For Kirsty Cotton (Ashley Laurence), the nightmares never end. Still fresh in her fevered memory are her father's skinned corpse, the evil machinations of her uncle Frank's reanimated body and the unspeakable perversity of the Cenobites. But the worst is yet to come. From beyond the Outer Darkness, from the darkest regions of the imagination comes Hellbound: Hellraiser II. 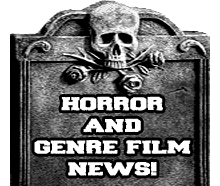 Review: Over the span of the Hellraiser franchise it has had it's ups and downs and even a shift in the style of film starting after the 4th film (Hellraiser:Bloodline). The only one to truly follow the same style and feel as the first film was the one we have here today Hellbound: Hellraiser 2. Alot of that could be because you have a good majority of the original cast and crew aboard for this sequel. Now with that said I must also add that it does go in it's own direction in ways and expands upon the story that really helps to make it a little more fresher. It's great to see Ashley Laurence reprise her role as Kristy Cotton as well as Clare Higgins as the demented stepmother and of course Doug Bradley as the chill inducing Pinhead along with his beautifully grotesque group of Cenobites. Now there is one thing that this film does or may do to you on your first watch and that is confuse the hell out of you, I say this because of the placement of some of the scenes. Basically this film jumps around alot. Which after you get the hang of how this film flows you can really start to get what is going on. Now for me what I enjoyed about this film and the original is the visuals, weather it's the demented halls of the psychiatric hospital or the amazing look of the cenobites. Now don't get me wrong because I do love the story as well, but there is something that just draws me to the visual look of this film. Would I say that this one is better because it amps up the gore and blood, no I will not but it does stand firm as the best sequel to Hellraiser. 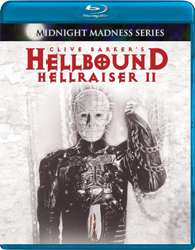 Now onto the part that alot of you really want to hear about and that is, is this blu-ray of Hellbound: Hellraiser 2 worth the upgrade or should I stick with my 2008 Anchor Bay released special edition? Well I have to say yes, but I only say that for the film itself, visually it is a step up from that special edition but it's not a hugely drastic step up because you basically get what looks like a blu-ray from the same source materials as the DVD release, but of course in HD which makes for better detail. I say buy the blu-ray of this release, but at the same time I would keep my DVD release because you get absolutely none of the special features that they put with the DVD. Overall this is a great HD release of the best sequel from the Hellraiser franchise and does deserve a watch!